This week, I got to visit a beautiful new grocery store near me in Sunnyvale, CA: New Seasons Market. If you live nearby, lucky you! Meet your new favorite place to shop. There are several New Seasons Markets in Oregon and Washington, but the store is new to California and I am excited to have one in my community. Apart from the gorgeous local produce, amazing flower selection, and natural food heaven, what was perhaps most impressive about this place to me was the company's ethics. They were the first grocer in America with a B-Corp certification, which means they have to meet rigorous social and environmental standards. Their employees seemed happy, fairly paid, and well taken care of, and they try to work with suppliers that have a similar philosophy. For example, in the front of the store, they had a tomato tasting for shoppers (who doesn't love that?!). 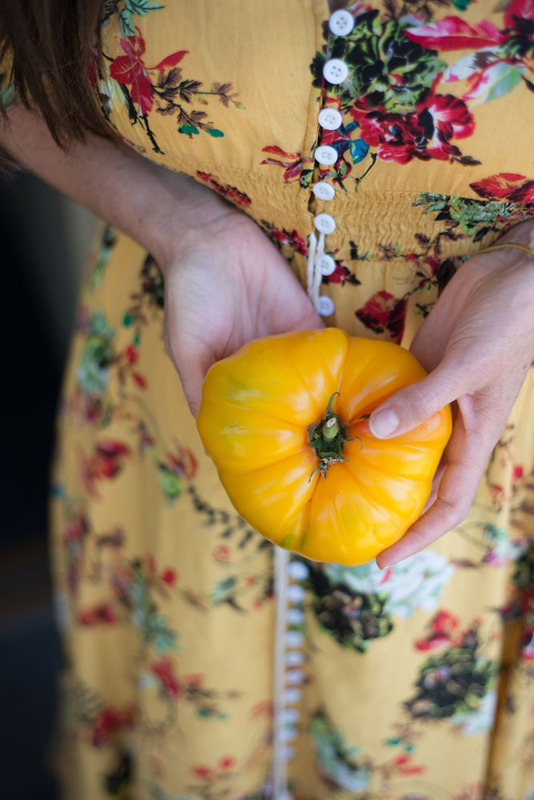 My favorite was a big, beautiful, yellow Brandywine tomato from Pinnacle Farms, which is about an hour from the store– a farm that's known for treating its workers well. New Seasons employees regularly visit this organic farm to see where the produce is coming from. The farm is committed to treating not only its workers, but also the land, community and environment with utmost respect. I got to have lunch at the deli and there were some really creative dishes on display. I had a watermelon salad that was so good that I decided to go home and put my own twist on it. I loved the addition of harissa (a red chili paste often used in Middle Eastern cuisine). I took home one of those yellow Brandywine tomatoes and had to include it! We are having a heatwave in the woods right now, so this is all I want to eat. Perfect for your Labor Day BBQ! Slice the tomato and watermelon into big chunks and lay them out on a platter. Sprinkle the red onion, mint and feta on top. Mix the ingredients for the dressing well with a fork in a cup. Drizzle the dressing over the platter. If you're in the Sunnyvale, CA area, I encourage you to stop by New Seasons Market. You'll love it! There's also a store opening this winter in Emeryville, CA. This post was done in partnership with New Seasons Market, and all opinions are my own. This is a great grocery store, and I was excited to work with them. Thanks for supporting the businesses that keep The Forest Feast going!